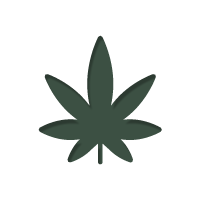 Pineapple Kush is a tasty treat that can benefit both recreational and medical users. With its uplifting effects and pleasant tropical aroma, this strain is well worth any cannabis aficionado’s time. Pineapple Kush is a fine example of a cannabis strain that harnesses old-school genetics to create a timeless wonder. Although the original creator of Pineapple Kush is unknown (or maybe a very well-guarded secret), the first instances of this strain hitting the scene were made from breeding Pineapple with Master Kush. Over time this has been adapted and refined by various breeders to maintain the qualities this exotic beauty is famous for, whilst enhancing various characteristics. A prime example of this is some of the work by Royal Queen Seeds. Their take on Pineapple Kush has been created from crossing Pineapple with OG Kush, and it has resulted in a plant that produces better quality bud whilst maintaining the same high and flavour of the original. As the name would suggest, Pineapple Kush has a very strong and distinct pineapple aroma. This is also experienced in the actual taste of the smoke itself, with the addition of earthy undertones and an extra hint of sweetness. One toke is enough to whisk you away into a tropical paradise. The hard hitting strength of Pineapple Kush will drop you into instant euphoria, lifting your mind sky high. As your mind wanders, Pineapple Kush works its way through your body, easing the muscles and dispelling the tension within them. It is extremely easy to get couch-locked with this strain, so it is best to ease into it (unless you enjoy jumping into the deep end). Even with a degree of caution, many unseasoned smokers will find themselves overwhelmed with one or two tokes. In terms of medical use, Pineapple Kush doesn’t fail to deliver. Due to its mood elevating properties and potent strength, it is most used to help with stress, anxiety, depression and pain. Anecdotal reports also report its use for ADD/ADHD, migraines, bi-polar disorder and arthritis. Analysis revealed that Pineapple Kush contains a THC content between 18 - 23% and a CBD content between 1 - 4%. Pineapple Kush is a fairly standard grower, and can be tackled with a good degree of success by novices – although there are easier first strains out there. Under an experienced hand, Pineapple Kush will really flourish and produce some bud that goes above and beyond. In an indoor setting this beauty tends to grow up to heights of 70 - 120 cm, and has a flowering period of 7-8 weeks. Outdoors, Pineapple Kush will grow much taller, reaching all the way up to 180 cm. In this situation, it is usually ready for harvest towards the end of September. As she grows she produces dense and resinous buds that become covered in a forest of orange hair; so much so that the orange begins to overtake the green - adding to its exotic mystique! In terms of yields, Pineapple Kush can produce a harvest in the region of 500-550 grams/m2 indoors and 500-550 grams per plant outdoors, making it quite a respectable bounty. On the whole, Pineapple Kush has a lot going for it. It has the potency. It has the flavour. It has the yields. 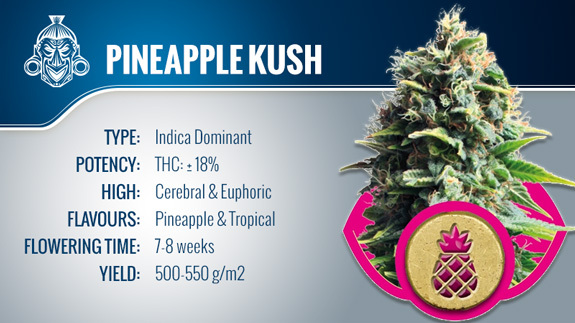 If you enjoy the fruiter side of the cannabis spectrum, then Pineapple Kush is well worth a look at. Even if your preferences lie elsewhere, there is a lot to be appreciated here. Have you ever tried Pineapple Kush? Experienced its potent ride to the tropics first-hand? Let us know what you thought in the comments below!